Should We Go back to Using Gold as Money? Many people these days are arguing for a return to using gold (or silver) as the primary exchange media. While commodities like gold or silver may have a role to play in defining the unit of measure of value, to revert to using such commodities as means of payment would create more problems that it would solve. (Part III of my book, Money and Debt explains the need to segregate the typical monetary functions and shows how to do it). Credit money is a higher stage of evolution than commodity money (including gold and silver). For more on this, see my slide show on the Evolution and Transformation of Money. Just because credit money has been monopolized and perverted, that is no reason to abandon it and revert to more primitive forms. Credit money instead needs to be liberated and perfected. Demanding gold as payment means you are not willing to trust your trading partners. Sure, that trust must be well considered. It should be based on relationship history, past performance, prudent judgment, and a willingness to take some risk. By organizing this process within credit clearing association, we can liberate the “credit commons” and mitigate the risks of default, while at the same time, reducing our dependence upon the dysfunctional political money and banking system. Why do we argue the minutia of details about gold vs credit vs fiat money vs tangible assets . The simple truth is that the US treasury does not have anywhere near enough gold to back every dollar in circulation today. BTW, we don’t even have enough gold to cover the amount of dollars in circulation before the latest runaway printing of money. And if we did purchase the amount of gold necessary to cover the money we have in circulation, we would do so with borrowed money because we already spend 40% more than we take in. And as we go around the world buying the last remaining gold reserves with borrowed money, we should expect the price of gold to go through the ceiling due to the shortages and increased demand. This would send the value of the dollar down due to the fact that $1600 would buy an ounce of gold in 2011, and after the buy-up of the worlds gold reserves, it would probably take 10 times that amount. That renders the dollar to 10% of its 2011 value. I can’t even begin to imagine a more absurd situation, yet this is the cornerstone of Ron Paul’s fiscal plan. WRONG… We have a saying down here in the south, “Locks keep honest people honest.” and while gold and silver coins might not be such a good idea for every day trade at walmart, going back to the gold standard would ensure what you have in your wallet is allways worth something. Gold is like a “lock”. Mass, nationwide, credit has absolutely destroyed people. Giveing credit to anyone you don’t personally know, that don’t live, or own a buisness litterally right down the street is a bad idea. I’ve made that mistake with credit, and now that I’m older and a little wiser, I don’t beleve anyone should owe anybody anything but a thank you. If you can’t afford it right then, don’t buy it. I don’t disagree with that. Under the present political money system, there does need to be a “lock” on monetary abuse. Gold measurement and gold redeemability used to provide that lock. However, we need to build a new non-political system of exchange based on local associations of businesses that know each other. Gold may be useful as a measure of value in such a system (other commodities would be better), but credit is what businesses require and typically provide to each other. 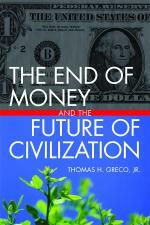 Please read my book, The End of Money, and you will understand. when has gold or silver ever been a 100% percent money. even when economies were dominated by gold and silver i expect communities had various trading media apart from national money. but if its good enough for communities as you say…why doesnt it make sense on a broader scale..as before? if people trust electrons on a screen saying how much ‘money’ they have why wouldnt an electronic international transfer of gold sitting somewhere be just as comforting? Why not move beyond the myth of money and politics all together? What’s wrong with reality? Why are we so afraid of the fact that there’s measurably more than enough of what we all require for our survival?What would happen if we began to fully utilize all that we currently know about FREE energy technologies and resources, and based our tremendous capacities to produce an abundance of all that we consume and allowed this abundance of to simply destroy any illusions of value? No, we should not go back to the gold standard for one simple reason. The only common denominator of all goods and services isn’t gold. No, the only common denominator of all the goods and services that we all consume is ENERGY, not money! allow the engineers and technical experts to utilize all that they know about FREE energy technologies and resources by simply measuring the most effective and or energy efficient ways to operate the entire global production and distribution system without any form of political – price system interference and a natural harmonious balance in nature will result and then and only then will we REALLY begin to solve our most complex problems. No academia here, so please excuse my thoughts if they seem a little simple. What seems to behove me about all this dialogue is the lack of acknowledgement or discussion around the extraction process that occurs through the issuance of credit money. 1. Whoever issues the credit money @ interest can now take his interest money, which he has garnered in exchange for little no human effort on his part, and use this interest money to extract goods and services which are produced through human effort. The net result being the issuer of the credit money has extracted human effort out of others in exchange for no human effort on his part. One might at this point start going on and on about all the human effort it took to acquire the credit franchise and all the capital, risks and liabilities associated with running the franchise including the risk involved with the default of the borrower as well we must not forget the time value of money. Personally as far as I can figure, that’s all a bunch of hokum! The players who understand the credit game understand the extraction process very well. Additionally they are the in many cases the same party playing the role of both the lender and borrower. 2. Who ever borrowed, received the credit money, has at this point not expended any human effort on their part other than signing the promise to pay, and they are now be in a position with all their effortlessly created credit money, to control, influence & extract human effort out of others. Again the net result being somebody in a position to extract human effort out of others at little or no effort of their own. Now what happens when the big borrowers have blown their wad, manipulated and controlled a whole bunch of human effort and cannot pay? No problem we just shift the obligation back onto the backs of the people we just finished manipulating by transferring the liability to the government with some sort of bailout scheme, subsidy, grant or what have you. Now the poor sods we just had running around in circles will jump through even more hoops to pay the tax bills to the government who then in turn forkout the bailouts, subsidies and grants and the interest payments back to the corporate borrowers who are the same folks who have the credit franchise who have now issued the credit to the government to bail themselves out. Nice. Now the credit franchise holders control and have ownership of whatever it is they borrowed the money for in he first place and the cost of the asset along with the labour involved as well as all interest payments to themselves are all being paid by the poor shmuck who doesn’t understand the game and will toil for the rest of his life to honour his debt and actually pay back his loans. In the case were the big borrowers receive big government contracts to create their profits to pay the loans to themselves back, the same transfer of burden takes place. They issue the credit to the government at interest to pay themselves. They end up controlling the assets, the people and the government. The good honest hard working people pay their taxes and their debts. Now what part of this system seems fundamentally, morally or ethically right? The folks that really understand the magic of credit money have no intention of paying back the loan and will transfer the debt back to the people. If the whole thing ends up taking a dump in the end and they have to right off all these unpaid debts, who really cares anyways when you own and control all the stuff. I have a hard time seeing any value in our credit, fiat money system and have a harder time trying to rationalize it. If these thoughts are way of base I would like someone to explain it to me. The Gold standard seems like a good idea to me because as long as we all know that at the end of the day, that all we have to trade is our till and toil, creativity and ingenuity what matters how tight the supply and demand for gold is. It takes and took human effort to produce and if there is a lot of it available and it’s easier to produce I will expect more of it in return for whatever goods and or services I am providing with my human effort. If gold is in tight supply and you got to work like hell to find it and dig it out, I will recognize your reluctance to trade with me for goods and or services that took a whole lot less effort to produce. The money token does what it needs to do whether paper or digital facilitating exchange of human effort. As far as time value is concerned humanity will always be looking for, exchanging and requiring goods and services over time and even if there were a static supply of gold the change in the relative value of goods and services based on supply and demand and our informed willingness to trade would be the material concern. So what if we quit mining gold, so a dollar pays for a years worth of your needs we can do the math and the time value gets covered off in goods and services exchanged and provided to somebody somewhere. The purchasing power of our money would only increase as economic and population growth occurred while the bulk of our useless gold sits on deposit the token facilitates trade. Had we stuck to a gold standard and caught on to the magic of the moneychangers and educated our fellow man I doubt this world would be in the environmental, moral and overpopulated mess it is in right now. Some might suggest this is just to simple for our advanced enlightened society. Just ask yourself hopefully as a seeker of truth and integrity which system would produce more truth and integrity, honour and respect for our fellow man and mother earth. Our intuitions immediately tell us whets right. We can try to convince ourselves that it is more complicated than this and we have to extrapolate for this and that. Be my Guest. Again if these thoughts are way of base I would like someone to explain it to me in simple terms and not with a bunch of economic minutia. What sort of environmental destruction would the world be in for if people decided to go looking for more/new gold and resources!? Barter based on existing skills and/or recycled material is a renewable resource that won’t wreck the world. Any form of money used intelligently can be used to enslave other people. Slavery was popular in the antique world – a world which also used gold and silver as money. Freedom and credit money are not contradictions. The bankers of this world who administer credit money enjoy greater freedoms than the bankers of the past who worked with gold as money. However, it is correct to say, that the credit money system makes it much easier to enslave a large number of people than under a commodity type monetary system. The ultimate problem is not so much credit versus gold money. It is the intense desire to accumulate large amounts of money – that’s the problem. Conncentrated money always enslaves other people regardless whether gold or fial. The trouble with credit money is that there is no limitation to the amount of credit issued. Under a gold system, the amount of gold held by banks effectively limits the amount of credit issued. In theory, credit money is backed up by treasury bonds which are a claim on future taxes. Politicians cannot agree on effective limits on the national debt. It keeps growing and growing. In a nutshell, credit money is immoral because it allows to shift the burden of repaying the debts to future generations. This is strictly speaking impossible under a commodity standard. There is a further strong argument against credit money. That argument has to do with sustainable economics. Historically, credit money displaced commodity money precisely because the gold standard did not allow for high growth rates of the economy. Credit money was introduced so the economy could grow faster and faster. Today we understand that continued economic growth is suicidal in the long term. We need to return to a commodity based monetary system in order to stop the ongoing economic insanity. In theory, credit money can be managed responsibly. Historical experience shows that this actually never happens. Central banking is ultimately politics. Once politics manages the money, insanity prevails. The ultimate question is: How much corruption are we willing to tolerate in monetary matters? Credit money invites corruption. The most recent real estate bubble is only one example for this phenomenon. Credit money is bad because it promotes the illusion that free lunches do exist. I reply only to object to your characterization of my remarks as hostile. You’re right, I have not read your book. I have however read thousands of words of your writings on the internet, and around Solari. I’m not completely uninformed although, I admit, I’m not a deep expert on your writings. There are thousands –countless thousands– of authors and experts on the web; we all make our decisions how to move forward in our own works, our own endeavors. And, I’m sure you haven’t read my work, you seem incurious and didn’t respond to my fundamental point. Perhaps, you’re completely unaware of the real possibility of P2P reorganization of the entire economy— a potential so far reaching, so dizzying that people just click onto the next message. At this point I don’t really care; I’m sure it won’t happen in my lifetime. As many poets have observed, people are not ready for freedom. I was born in the wrong century. I don’t even expect to escape. But if you’re curious these are kind of, my pitiful little contribution. http://ledgerism.net/STR.htm i.e. post your offer and acceptance on a public transaction repository, how hard is that? http://ledgerism.net/arapcloud.htm i.e. why can’t robots clear the mutual payables/receivables? It’s a mechanical process. How much work do banks invest in clearing? NONE. http://ledgerism.net/devices.htm When will we the people be able to assert our identity over networks, without a server!! This is 2007 folks. retired cpa and all around worthless mf and curmudgeon. Where do you bank? What credit cards to you currently use? Does your community have a community currency? Why not? “Silver and Gold are freedom.” This is almost too stupid for words and something Orwell might have used if he had written a spoof of “Atlas Shrugged”. But it does glitter nicely does it not? Gold currencies and credit are not opposites, Franklin Sanders! Gold was merely the unit of account and store of value. There is a whole body of economic literature arguing persuasively that credit historically precedes money (standardized units of account). Credit is necessarily built on trust, as are communities (and their potential currencies). I would invite anyone who is enamored with Gold to do the minimum homework on the history of gold currencies rather than just get transfixed by that glitter. Using gold and silver coins as a currency, reflects their popularity with millions of ordinary people around the world. If you have read my work — sounds like you have not — you would know I promote doing everything we can to ensure that tangible resources are not allowed to be bought up and controlled by centralized power — whether water, precious metals, natural resources, land and so forth. That is exactly what misuse of fiat currency is now allowing to happen. Yes, I do recommend Gold Money and other private systems that allow people to buy and own precious metals, along with coinage. Having lots of such private systems helps to decentralize, and coins even more so. This is only a piece — it takes many things to decentralize. Most of all I support the idea of communities having the freedom and options to try whatever systems they would like to try — using tangible resources to back them or not. All of these systems will need to cover their overhead — which is what most fees reflect– the value of the services provided, ideally as much or more than the costs. Your hostility sounds like the hostility I find in many quarters who argue adamantly against financial sustainability or building of financial equity — a strategy which contributes greatly to the even greater concentration of real and financial wealth into large corporate hands. It forces people who need to support a family into working for corporations, as financial sustainability is ever hard to maintain outside of the corporate world. It is the right and responsibility of communities to decide what they want to try — not you or me or our colleagues. And it will fall to them to protect these systems against politics, fraud and inflation — of the kind that players from those from places and people like Wall Street and the Russian mafyia can do. Easier said then done. The common characteristic of her work, including Solari, is an architecture that provides a commission or fee for the operator. Ironically, that is precisely the characteristic that nobody in the alternative economic movement will ever allow to happen. We will rather freeze in the dark than go into another oligopolistic, centrally controlled architecture. Especially today, with over 15 years of architectural discussion and design, on systems that liberate the exchange process without central capture. So, forgive me but I cannot help but resent the businessmen and women who confuse and mislead the public. Tom is absolutely right: we need mutual credit based on our own indigenous credit, our own lifetime of accomplishments, our track record of honoring our promises. Introduce gold, and that will never see the light of day. Coasian dynamic sets in. Transaction costs are lower with gold– people avoid the analysis of creditworthiness, let alone, legality, ethics, environment or anything else besides the gold. Why bother at all? We already have that with the U.S. Dollar. With all due respect and solid sympathy for your disgust with our present monetary system, I have to dispute your facts. Credit is not in any sense a “higher evolution of money.” It’s not even before it in time. Credit was known and used to enslave already in Babylonian times (hence the epithet for our system, “Babylonian”) & it’s use nearly ruined the Athenians until Solon broke credit’s back with his law, “The Shaking Off of Burdens.” If anything, gold & silver money is a higher evolution of money. Wherever credit has been used, it has concentrated money & power into the hands of the issuers, gradually transferring all of society’s property to them, and all government power. If it’s decentralisation, freedom, honesty, and trust, one could hardly imagine a worse vehicle than credit money, which always destroys those things. Credit is slavery; silver & gold are freedom. Using silver and gold as a primary currency or 100% makes no sense — I agree. However, using gold and silver coins to START a community working towards building community currencies is a terrific idea. Gold and silver are concrete. People understand and recognize gold and silver worldwide — essential for trading and valuing things village to village. They agree that it has value. For North Americans, it starts them moving out of a “dollar” paradigm and learning about currency — this is quite a learning process. Starting community currencies from scratch is highly complex, time consuming and very suseptible to fraud and failure. If we start with gold and silver coins were people are willing to do that, we are using a currency that is rising in value, as opposed to one that may or may not have any value. So, traditional gold and silver coins as well as digital gold and silver offer a simple practical first step which is much easier and more energizing than inventing your own currency. I would encourage you to reconsider and think “and + and + and” on this one. We need communities and networks having robust options. We need to try lots of things. We need an evolutionary, organic process. Gold and silver have a very important role to play in getting us going. I would also note that without transparency of government and shared resources and credit by both place and function, no currencies will work — whether they are tangible or fiat.